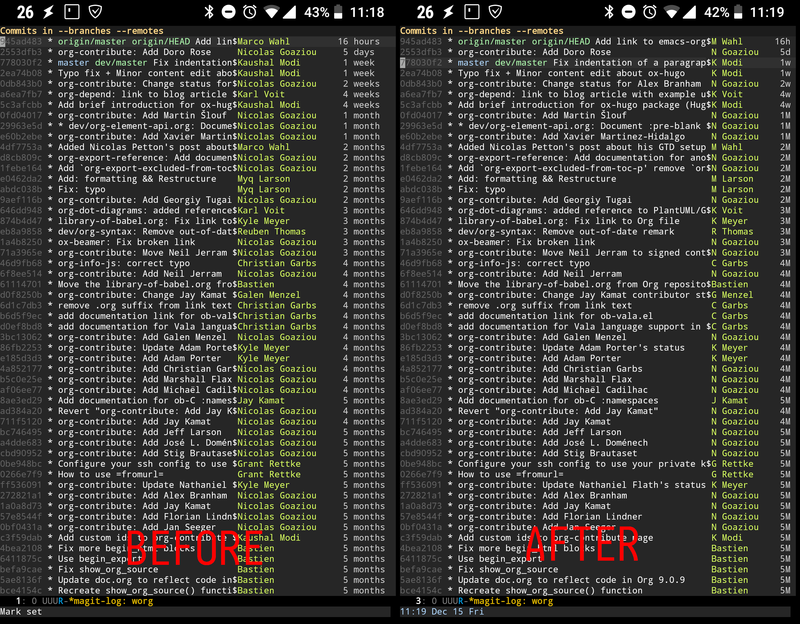 Before I jump to the code, you can see in the below figure how the author and commit age columns took up roughly half the screen width on my phone before the tweak (left), and how much easier it is to read the commit messages after the tweak (right). Abbreviate the authors’ first names to just their initials. Abbreviate the commit ages to 1-character time units. To implement those tweaks, I started digging through magit-log.el and found that I would need to customize (i) the magit-log-margin variable and (ii) magit-log-format-margin function. Customizing magit-log-margin variable allows me to use the abbreviated age instead of the verbose age strings (minute→m, hour→h, day→d, week→w, month→M, year→Y). It’s also where I specify how wide I want the author column to be.. I can now reduce that column width from the default value of 18 to 11 as I am abbreviating the author name too. Reviewing the magit-log.el code, I realized that I also need to advise the magit-log-format-margin function to implement the author name abbreviation. In the below code snippet, I am using use-package1 to customize that variable and function in magit-log. ;; too much commit message truncation even on narrow screens (like on phone). "The first arg is AUTHOR, abbreviate it. First       -> First (no change). It is assumed that the author has only one or two names." I need to set the magit-log-margin value in the :init block because that variable dynamically sets many other variables in magit-log at the time of loading. So we cannot wait for the whole magit-log to load before setting that variable. I wouldn’t need to worry about this if I were using the Emacs Customize interface to set this variable. I use modi/magit-log--abbreviate-author to add a :filter-args advice to magit-log-format-margin. The signature of the advised function is (magit-log-format-margin REV AUTHOR DATE) (as of Magit 20180809.1716). So the advice basically replaces the AUTHOR arg with its abbreviated form as explained in the modi/magit-log--abbreviate-author doc-string.